If there’s one Filipino trait that we could never ever get out of our system, it’s the value of taking responsibility for fellow Filipino especially abroad. We feel like accounted for each others, and though there is no formal instruction that we should take care of each other, it’s our innate nature that has been deeply rooted to our culture to look at each other’s welfare. This is one reason why Filipino communities exist around the world. There is always a reason that binds the Filipinos who are living abroad. It could be the ethnicity like a community of Ilonggos, Bisaya, Batangueno and more. It could also be a passion like a group of travelers, or photographers, or even dancers. Whatever it is, Filipino could always find a reason to form a community. 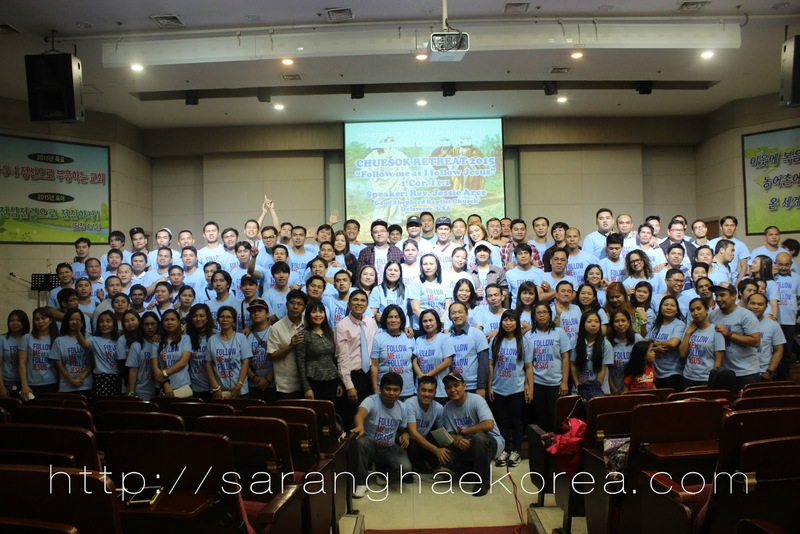 In the context of Christianity, Filipino believers of Christ have also communities in Korea in the form of a church. People can freely express their faith and belief here in South Korea, that is why joining or attending a church is not a problem. Like any other Filipino communities in Korea, Filipino Christian churches have been the comfort zone of some OFWs in terms of nurturing their spirituality. This is where a believer could feel the sense of belonging. As a Christian, one of my primary concerns when I came here in Korea was to join a Christian community. It took me almost one year before I was finally invited by a friend to attend the church at Sinwoldong Sungkyul Church Foreign Ministry which is by the way 3 hours away from where I work. 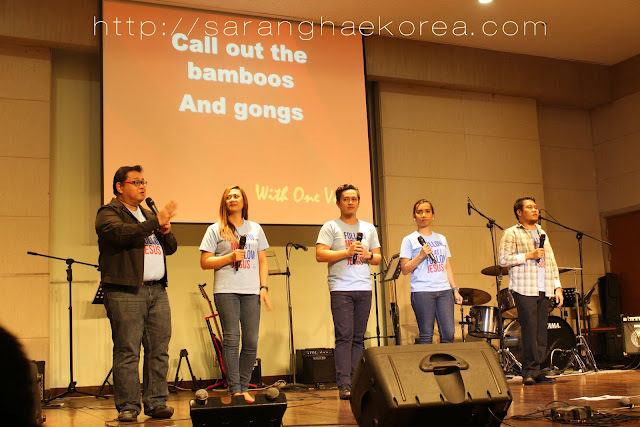 Attending a church in Korea with fellow Filipinos are no different from the church I was attending in the Philippines. There’s the usual praise and worship, devotional, and of course listening to pastor’s preaching. But unlike in the Philippines, there’s always extended fellowship here. Most churches here offer free lunch to the churchgoers since worship service usually ends up at around lunch time. This is one of the best times to talk to fellow OFWs, listening to their concerns and whatnot. I find this somehow therapeutic because you will get to realize that your hardships are no different from the others. It’s one way of saying “I feel you brother” without saying the exact words. And sometimes, you get to pray for each other since you both understand the situation. I guess if there’s one advantage of joining a Christian community over any other communities in Korea, it’s the assurance of being taken cared of without compromising anything. I mean, when you are in a community, most often than not, you talk problems over bottles of soju and beers. Or you help each other escape reality by partying and drinking all night. I don’t judge communities doing these activities. What I am saying is, Christian community has better approach of dealing difficult situations. It’s the same “pakikisama” but different meaning. Let’s take for example last Chuseok. A holiday like this is a perfect time to meet up with communities or group of friends to do whatever activities they have in mind. However, churches find this a good opportunity to gather and do spiritual retreat. 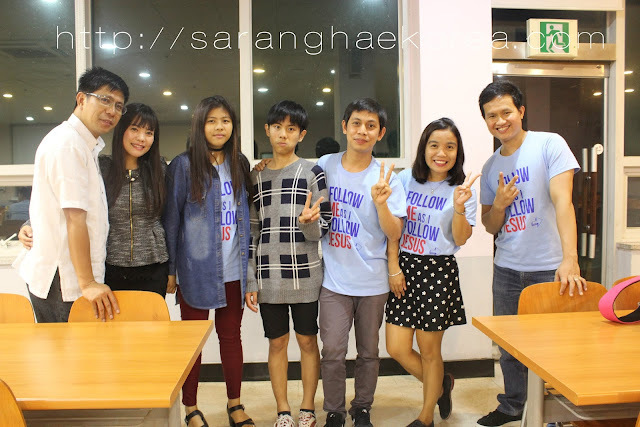 The church I am attending joined the other group of churches for a 2 days and 1 night Chuseok retreat at Incheon with the theme “Follow Me As I Follow Jesus”. The event was attended by 5 other churches that travelled all the way from Ulsan and as far as Busan. Rev. Jessie Arce of Good Shepherd Baptist Church flew all the way from Delaware, USA to grace the event as the guest speaker. There were a total of 169 attendees, 169 people who chose to nurture their spirituality first rather than going to holiday parties. In the retreat, we learned the true meaning of being Disciple. That it is not just all about modules and lessons and memorizing verses. Discipleship is a lifestyle, it is sacrificial but also rewarding. And learning lessons like this makes attending the event more productive than doing any other activities. In gatherings like this, you will see how every member of the community reach out to each other and how the fellowship, worship service and singing of praise lifted the spirit of everybody. For me, it’s one good way to temporarily forget the hardships of living abroad and to improve the perspective in life. Aside from nurturing the spirituality of every member of the church, Christian communities also help improve the social aspect of everyone by going on trips with fellow believers. Activities are not just all inside the church building. As a group, they usually go out of town trips to enjoy, relax and sometimes bond with nature seeing that Korea has a lot of tourist destinations that must be visited. I can’t guarantee that Christian communities are all perfect. Of course, misunderstanding and arguments also happen and these are just inevitable. But a cup of coffee and a session of prayers can always do miracles to bickering members of Christian community. So if ever you are in the area and you are looking for a church to join in here in Korea, I have here a list of churches, the missionary in charge and their contact numbers to reach them.